As Prime Minister Tony Abbott again attacked renewables for their presumed impact on consumer bills, wholesale energy prices in Queensland have slumped to unprecendented lows as rooftop solar continues to boom in that state. The dramatic fall in wholesale prices underlines why generators such as the Queensland government-owned Stanwell Corp and CS Energy want the renewable energy target to be brought to an end. Nearly 4,000 households a month are applying to put panels on their roofs in the south-east corner of the state alone, as consumer bills soar again. These softening impacts on customer bills from renewables come because they force down the wholesale of electricity, and incumbent generators do not like that. Queensland is notable because it has installed very little large-scale renewable energy. There are no wind farms in the state, apart from the old Windy Hill installation in the north of the state, and just a few hydro and biomass plants. In solar, however, it leads the world, with more than 1.1GW installed. According to a new report by Energex, it now has the highest per capita solar uptake in the world, with more than one if four houses in the south-east corner having rooftop solar. Here is another way of viewing the contribution of rooftop solar, taken from the APVI’s live solar map. 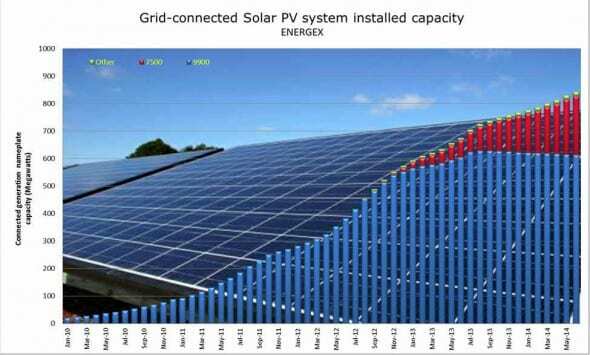 It shows the contribution of solar in Queensland on July 1 at more than 10 per cent around noon, with output of more than 600MW, equivalent to a coal-fired power station. 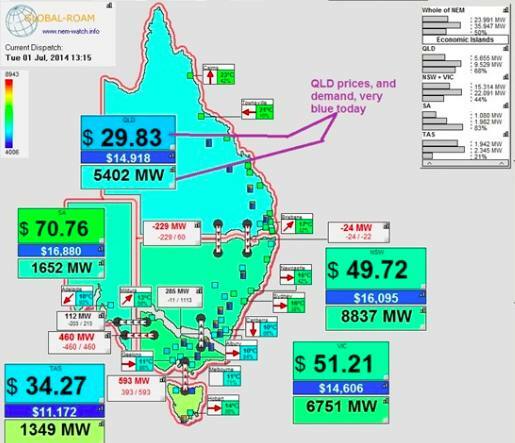 To get another view of what happened in prices, this table from Global-Roam data , which has its own detailed explanation from Paul McCardle on his Watt Clarity website, shows that Queensland prices were well below the Australian average on Tuesday. Indeed, nearly 4,000 homes in south east Queensland are making applications to install rooftop solar each month. Australia-wide, solar – currently standing at 3.4GW – is predicted by Bloomberg New Energy Finance to jump to 23GW by 2030, with 5 million homes installing rooftop panels. 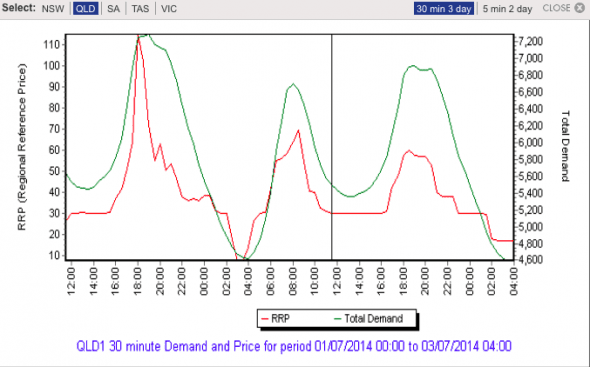 BNEF has described the rooftop solar market as ‘unstoppable’ – not just in Australia though. Its 2030 Market Report released this week predicts $7.7 trillion of renewable investment across the world in the next 15 yard, with solar to make a significant contribution, including in the major markets of US, China and India. The Energex network, which operates in the south-east corner and Brisbane, added another 13.7MW of rooftop solar in June, to take their total installed in the Energex network to 843MW on 261,500 homes and businesses. Another 3,563 homes added solar in the south east corner in June, despite the fact that they would only get paid 8c/kWh for electricity they export back into the grid. From Tuesday, that payment by the network ceases and falls to retailers. But the payment is voluntary, and has to be negotiated between the customer and the retailer. More than 59,000 houses – with some 200MW of rooftop solar – now find themselves in this situation. 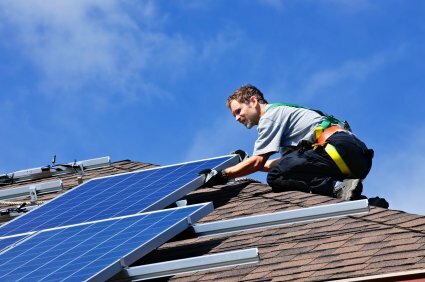 Whats more, new rules have been introduced which allow the network operator to require that no exports can be made back to the grid for new rooftop solar systems. Ergon Energy explained its reasoning here, saying it wanted to prevent “reverse flows” and encourage more solar and energy storage on its network. Look out Toxic Tony fossil business model unravelled already! Most Pollies aren’t dumb. They know what would happen to their sponsorship from many Big Biz corps if they promoted and encouraged the fast development and deployment of renewable energy. These Big Biz corps enjoy political protection, make mega profits, and so all is well, except for our environment. And to justify dubious decisions and policies, scientists are demonised and ignored by the spin doctor element. This cartoon just about covers it . . . . .